“Men are from Mars, women are from Venus,” was the title of author John Gray’s early 1990s book about the psychological differences between the genders. Almost three decades later, we’ve come to understand the sexes aren’t so different after all. In its report on 2015 Cosmetic Surgery National Data Bank Statistics, the American Society for Aesthetic Plastic Surgery reveals men and women do in fact have similar desires – to look and feel good. There are increasingly striking similarities in how both sexes are addressing their shared ideals today compared to nearly 20 years ago. In the infographic below, we share insight into the world of plastic surgery by the sexes, and show just how much it’s grown over nearly 20 years. Interested in determining what plastic surgery procedure may be right for you? 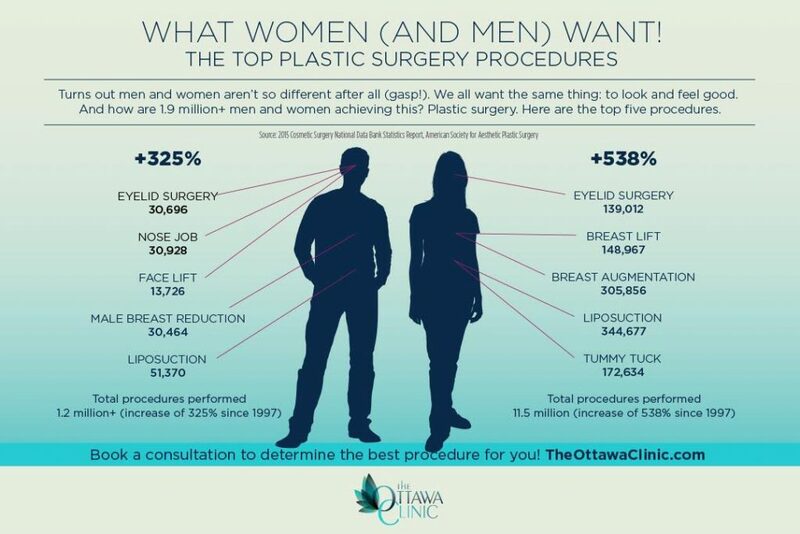 Get in touch to book a consultation and have a discussion with a board-certified plastic surgeon at The Ottawa Clinic. If you want to learn more, or simply have a conversation about our services, don't hesitate to contact us. We're here to help.